The sixth in an ongoing series of entries about vintage sports identities. Sports fans, as I have often said, are the most ardent brand loyalists on the face of the earth. There are stories to be told here at the intersection of art, commerce, history, and fandom. 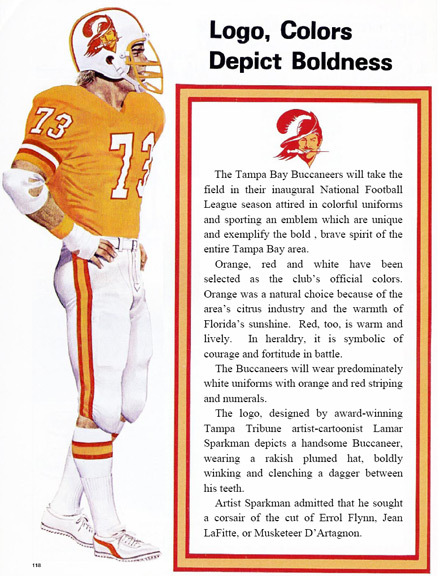 The Tampa Bay Buccaneers' original "creamsicle" uniforms are back in the news. For the past several years, the team has hosted a "throwback day," complete with retro uniforms, field markings, and era-appropriate in-stadium music. It has proven to be a very popular promotion, one that showcases the now-classic orange and red "Bucco Bruce" logo, once derided and now embraced. Nostalgia is a powerful emotion. In April 1974 the NFL granted an expansion franchise to Tampa, Florida, slated to start play in 1976. "A name the team" contest resulted in the name "Buccaneers," the winner over other choices such as Sailors, Buzzards, and Coastal Tides. The new team's logo was introduced to the public on April 14, 1975. "The Tampa Bay Buccaneers will take the field in their inaugural National Football League season attired in colorful uniforms and sporting an emblem which are unique and exemplify the bold, brave spirit of the entire Tampa Bay area. Artist Sparkman admitted that he sought a corsair of the cut of Errol Flynn, Jean LaFitte, or Musketeer D’Artagnon"
Reports indicate that the team had wanted to choose colors of red, green, and orange. These colors, however, were too similar to those of both Florida A&M University and the Miami Dolphins. The Bucs opted to create their own singular identity with a color scheme unique to the NFL. Sports uniforms and identities are often made or broken by the success (or failure) of the team that's wearing them. In the case of the Tampa Bay Buccaneers, defeat came early and often. The team lost their first 26 games, going 0-14 in that first (1976) season. The logo—dubbed "Bucco Bruce," and the uniforms—referred to as the "creamsicle" uniforms, became the visual embodiment of a losing franchise. They enjoyed just three winning seasons in the orange jerseys. When the team decided to scrap their identity in 1997, fans and media reacted positively. An April 8, 1997 article in the Orlando Sentinel featured the headline "Bucs Push Bucco Bruce Overboard." It stated that "Bucco Bruce was fortunate to be born with only one eye. He got only a glimpse of the Bucs' futility as they went an NFL-worst 100-223-1 in his 21 years as mascot." The Buccaneers went on to win a Super Bowl on January 26, 2003, a win that permanently distanced the pewter and red look from that of their hapless, creamsicle-clad ancestors. The team had both mediocre and downright awful seasons in the years following the Super Bowl victory. They decided to bring back "Bucco Bruce" and the orange uniforms for a November 8, 2009 game against the Green Bay Packers. The Buccaneers won 38-28, snapping an 11-game losing streak. Lamar Sparkman—the Tampa Tribune artist that created the team's original look—passed away in January 2010 at the age of 88. He was said to have been very happy to have seen his logo revived a few months earlier, even if for a single game.